The first and only training of its kind, from the industry leader, The Calm Monkey. Make a positive difference in the world. Be the champion who brings the benefits of mindfulness meditation to your workplace or community by becoming a Mindfulness Meditation Facilitator. Quickly startup and sustain a successful workplace program, and make a difference in other people's lives. How to gain support and build an engaging, self-sustaining program at low to no ongoing operating cost. Show the business value of bringing an ongoing mindfulness meditation program into your organization or community. How to avoid mistakes that can kill a program or put you at risk. How to become a competent facilitator. Passionate individuals with a personal mindfulness and/or meditation practice, who want to learn how to get company support and build a successful workplace or community meditation program. Students are employees working within organizations or individual professionals eager to expand their skills. See course description for eligibility requirements. See FAQ for frequently asked questions. 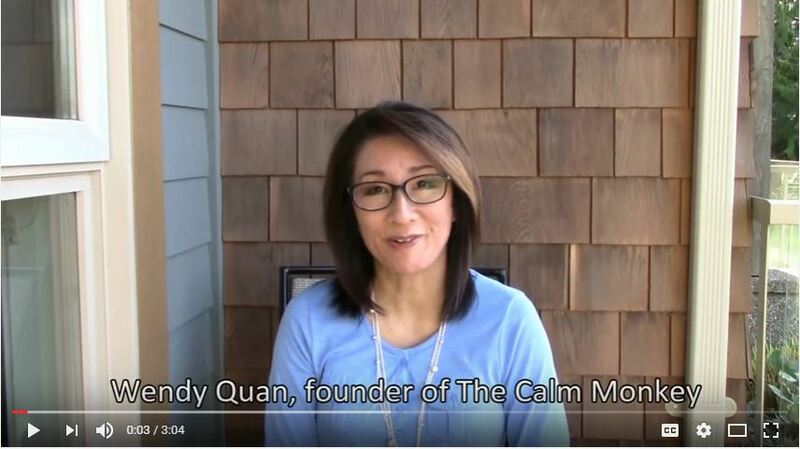 Wendy Quan, founder of The Calm Monkey, is the industry leader helping organizations implement mindfulness meditation programs and combining change management techniques to create personal and organizational change resiliency. She trains passionate meditators to become workplace facilitators through workshops and online training. Wendy is a certified organizational change manager who has been recognized as a pioneer by the Greater Good Science Center at the University of California, Berkeley and the global Association of Change Management Professionals. Her clients include individuals from around the world and organizations such as Google and the government of Dubai. Wendy’s career has included management in human resources, organizational development, coaching and information technology. Wendy is a leader in the change management community and founded the Vancouver Change Management Practitioner's community of practice. Through her change management experience and successful journey through cancer, Wendy delivers results in a practical, open manner that has broad appeal and evidence-based benefits. Her life's goal is to help people create a better experience of life. • Both registration and payment are required for every person accessing this course. You must log in using your CPHR BC & YK login and password to receive member pricing. • Trouble logging in to PD On-Demand? Watch our video tutorial or click here for help. • Questions about registration or receipt can be directed to pd@cphrbc.ca. Member $673.00 $735.00 Total Savings of $273! Non-Member $897.00 $980.00 Total Savings of $364! A full refund, less a $25 processing fee, will be issued for cancellations submitted at least one week prior to an event or workshop. Attendee substitutions are permitted; however, member/non-member rate differences will apply. Please submit cancellation or substitution requests by fax (604-684-3225) or e-mail (registration@cphrbc.ca). Please note that this policy does not apply to conferences, exams or no-charge registrations. CPHR exam fees are non-refundable if registration is canceled after the registration deadline. Please note our deferral policy.